The view and the restaurant sitting was awesome. Its very cozy and close to nature. The air conditioning worked well. The beds were comfortable. Awesome room facing the river and the gorge, clean, tidy and modern bathroom. Wonderful, outback style place. Great view and swimming in the gorge! 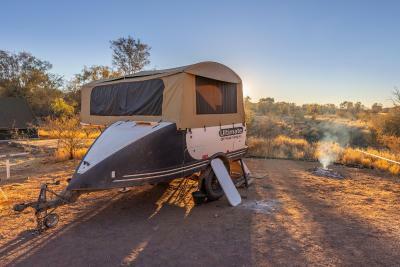 This is extreme outback so more expensive than elsewhere but worth every cent. Our room was basic but clean and comfortable and faced the brilliant red walls of the gorge. The restaurant meal was excellent. There's a BBQ and outdoor cooking facilities to cook your own. 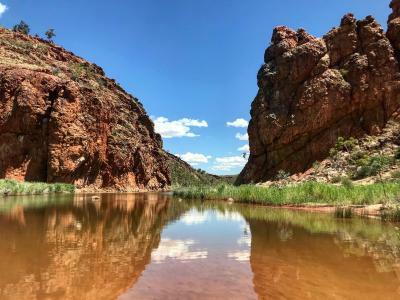 Easy walk to the beautiful waterhole and Finke River. The staff were very hard working and enthusiastic but there needed to be a few more of them. The restaurant staff were very professional and made our dining experience very pleasant. The dinner and live entainment was also very good. The location in Gorge was lovely. This rustic hotel way out in the outback had a first rate chef!!! Delicious food! Gorgeous views of gorge, especially at night when the fairy lights were on. Dinner portions were very filling and tasted nice. Glen Helen Lodge This rating is a reflection of how the property compares to the industry standard when it comes to price, facilities and services available. It's based on a self-evaluation by the property. Use this rating to help choose your stay! 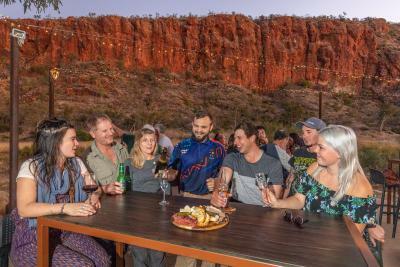 Glen Helen Homestead Lodge is located within West MacDonnell National Park, 6.8 mi from the Ormiston Gorge. It offers an outdoor barbecue area, a beer garden and an outdoor pool with a natural swimming hole. Guests can choose to stay in a lively dorm room or in the comfort of their own private room. 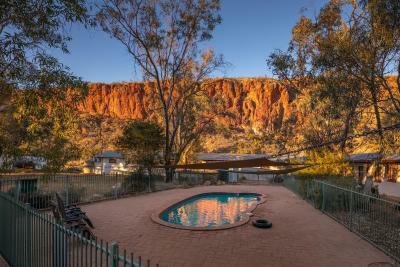 Some rooms offer air-conditioning and views of Glen Helen Gorge. WiFi is available for an additional charge. The staff at the information desk can arrange for personalized tours with an experienced guide. Helicopter flights and nature tours can also be arranged. 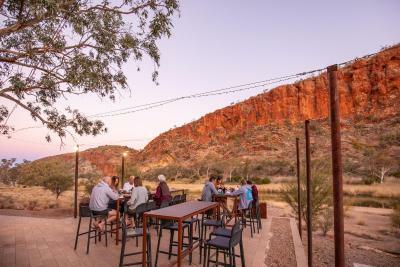 Namatjira Restaurant and Gallery features a cozy outback setting. Guests can relax by the open log fire while enjoying local cuisine. 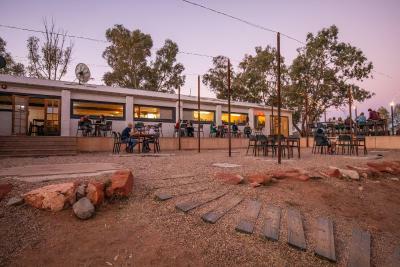 Glen Helen Homestead Lodge is located 81 mi from Alice Springs. The property serves as a great base to explore the surrounding areas. This property also has one of the top-rated locations in Glen Helen! Guests are happier about it compared to other properties in the area. This property is also rated for the best value in Glen Helen! Guests are getting more for their money when compared to other properties in this city. When would you like to stay at Glen Helen Lodge? This air-conditioned guest room offers free bottled water, a fridge and an private bathroom. This air-conditioned guest room offers free bottled water, a small fridge and an private bathroom. House Rules Glen Helen Lodge takes special requests – add in the next step! Glen Helen Lodge accepts these cards and reserves the right to temporarily hold an amount prior to arrival. If you expect to arrive outside reception opening hours, please inform Glen Helen Homestead Lodge in advance, using the contact details found on the booking confirmation. Please note that there is a 1.5% charge when you pay with Visa or Mastercard credit cards. The smell of sewerage was terrible. The restaurant food was good. Very expensive for what is provided...there was nowhere to put our bags in the room. A few glasses in the room would have enabled us to drink more easily out of the bottles we had in the fridge that we brought. Great location. It's obvious there is work going on to update the facilities. Quite expensive for what you get. Rooms are very basic and had an unpleasant aroma. Toiletries supplied barely enough for one person. Untidy around the place, towels and shoes left by others outside rooms. Limited free wifi which is only available in the reception area. It is important to know there was no Vodafone coverage in the area, thus totally no internet nor you can call. The area is full of flies (insects). Overpriced and kind of monopoly option to stay in since it is in the middle of nowhere. The overpriced kangaroo dinner was very nice and tasty! The place is big as horizontal landscape and quite which make the place a calm area to sleep fast. Property is very run down & facilities are poor. The room was like one you would expect in a backpackers lodge. Supper was very disappointing. This is a former cattle station, what you can expect? :) You don't have many choices in the bush, and if you decided to go there, this is a good place to have a relaxing night. Price for a room is quite high for a room. Surrounding is very beautiful with a beautiful creek for a swim. Food is very good in the restaurant. No tea and coffee making in the room. I've never encountered this in Australia before and it is so needed in a hot dusty dry location. Only one free small water in the fridge for 3 occupants of the room. No TV in the room but reception was available because there was a TV in the restaurant. Noise from next door room could be heard through thin walls. One tiny rubbish bin for bathroom and mainroom. This place calls itself a 'lodge' and a 'resort'. It is neither! It is a good basic motel with minimal comforts. It needs to drop the fancy names that don't fit what you find there. The bed was clean and comfortable. The bathroom was modernised. The airconditioner worked well in the heat. There was a pool to swim in. 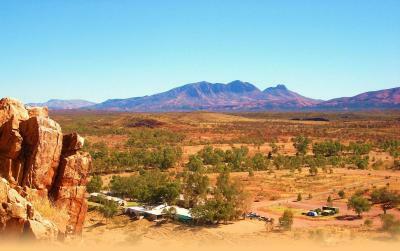 The motel is 300m walk from the gorge. Food good. Ambience, setting in the gorge, country feel from outside yet rooms were tidy and clean. Staff was super good. Unfortunately, we had to leave same night we checked-in due to Emergency Evacuation (Bush fire issue). 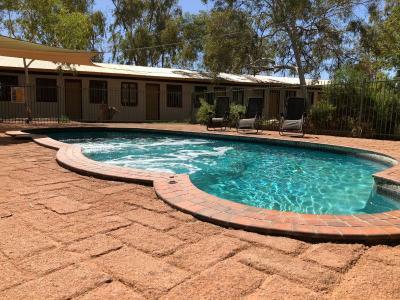 But, we were given an excellent accommodation in Alice Springs for rest of our stay. Manager was very responsive and supportive. We missed living our complete stay at Glen Lodge due to evacuation.